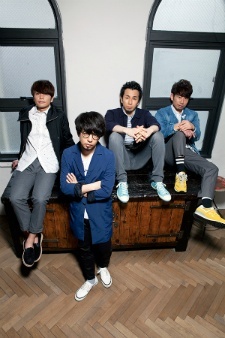 Asian Kung-Fu Generation is a Japanese rock band formed in Yokohama, Japan in 1996. For nearly its entire career, the band has consisted of vocalist Masafumi Gotoh, guitarist Kensuke Kita, bassist Takahiro Yamada, and drummer Kiyoshi Ijichi. The band's musical style is influenced by seminal Western punk and alternative rock acts in conjunction with their own local Japanese indie rock background. As a result, their songs maintain a balance of various aspects of the genres, most typically expressing fast-paced tempos and prominent, hard-edged guitar riffs as well as rhythmic flow and emotional lyrics. Despite the indie nature of their music, the band has enjoyed worldwide commercial success in addition to critical acclaim. They are performing the 2nd Dororo OP! Maigo Inu to Ame no Beat, Rewrite, Haruka Kanata, Kouya wo Aruke, Re:Re, Aru Machi no Gunjō, and a few more... I think this band should have more of their musics in anime.